A side project of Ben Gibbard, one of the guys behind Death Cab for Cutie, this electronic indie pop group was recommended to me first by my loving sister. Yes, she does know my taste in music, eh? In any case, when I first heard them, I was going nuts over it since I’m a big electronic freak and DCFC was the rage. So when you hear Such Great Heights, you’ll know what I mean. 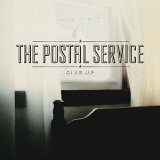 While the entire album is great indie electronic, I believe I would have supported this group by getting Give Up for just that particular song. As usual, I got my fix on . If you willl notice soon enough with the next couple of album reviews, that I must be going through an electronic phase. Dance and trance. Gotta love it. Did you hear their last remix? it’s great.